Never harmfully bend the will of others to please yourself or for unjustly 'evil' use. It will come back tenfold to you. Good! I never cared much for the green complexion! But, a quick question. What if the bending of the other person's will is not "harmful", "to please yourself," or "unjust"? In other words is there ever a time when a white witch may bend someone else's will...or is it strictly not allowed what so ever to them. And presumably the non-white witches do "bend" other people's will for nefarious purposes (that, or attempt to, or think they are able to) ? I really don't think the 3-fold, 10-fold, or whatever-fold rules actually apply in the practice of magick. In my best estimation and from experience magick is a tool like anything else and can be used for good or bad ends. No matter what method you use to benefit yourself there will always be someone who is denied because of that method. Take getting a job for instance, you may get a job but your getting that job denies someone else from getting it. 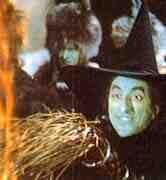 I wonder how many witches here beleive in the "survival of the fittest" mentality. Equality is a lie. I thought that was you in the avatar! Nice pic BTW.